For cleaning tough, baked on food from your grill, oven, or panini press, look no further than this 11" wire brush! Featuring heavy-duty stainless steel wire bristles and a stainless steel scraper on the back of the brush head, this grill brush can tackle even the worst grill surfaces with ease without the fear of the bristles breaking or bending during use. Its 11" handle is contoured for a comfortable grip and also has a hang hole for easy storage when you're finished cleaning for the day. This works great for scrubbing the grill clean. The metal brush is holding up well and are able to scrub all of the grim away, well worth the price. These brushes are great for cleaning the grill after a heavy load of cooking. Scraper comes in very handy to clean in between the grates. These 11 inch brushes were so cheap i had doubts they would work on our char grill but they worked and lasted so lone we ordered a case, good product. Great for cleaning and scraping. Will get almost nything off and will not rust and easy to clean all the gunk that comes off of the surface with ease. It does the job... But I would spring a little more and get the Carlisle one. But then again the metal on this one seems a little more sturdy. Cant beat for the price. I bought this brush with Scraper with no real expectations. My Weber grill is 9-10 years old and hasn't been treated very well other than the occasional quick scrub with some balled up tinfoil. But I did my best to put it to good use and was pleasantly surprised. Overall it performed well and I was awarded with fresh metal grids for future grilling. This 11" wire grill / oven brush with scraper works well in our kitchen to help keep our oven and grill clean and ready to use. Bought these to help in cleaning my ranges, cast iron pans and flat tops. They work great. A few bristles fall out from time to time but that's only because of the wear and tear they go through when deep cleaning. I will buy again when the old ones wear out. I've had my current ones for over a year now. It is possible to see some residuals of dressings or meat pieces on your panini grill after toasting sandwiches. It is easy to clean them with a couple of touches. This is a strong, durable product with thick bristles perfect for cleaning all debris from our grills and it also used to scrap out any grime that may have accumulated in the oven. simple but very good and comfortable, this brush is ideal for small grills although it is not very strong clean the surface very well, it is a brush that we should always have for small parties where we use small equipment. Excellent for cleaning off our grill. We use this on both of our grills, in the restaurant and portable/outdoor. The scraper on the end is perfect for getting big buildups off of the grates. Good quality grill brush. It really works well to brush off the burned on deposits on the grill, and the grid. With price like this, there's really no complain. Wish the handle is slightly longer though. This is a review for 11 inch wire grill brush and scraper! This product is strong and sturdy and nicely designed! We would recommend it! Does the job...well! 4 stars! Excellent Product , we bought two of these and we love them , cleans the charbroiler really good , the price is good and i highly recommend it . I got this grill brush to clean my pizza stone. You don’t want to scrub too hard and damage the seasoned finish, but it’s perfect for brushing off baked on bits to get them off the surface of your stone. The convenient size is perfect for home use. 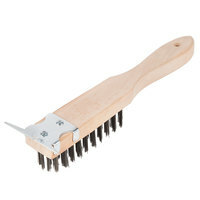 This heavy duty grill brush with scraper is great for restaurant of home use. The bristles are a nice heavy metal and the handle is made of thick wood. Works great! A combination of wood and metal, this brush is a strong one for cleaning racks and grills. The length is 11 inches, and the bristles are sturdy and plentiful, with a scraping end piece and a wooden handle. This 11" grill brush with scraper is great for any bar, restaurant or home grill. Stiff metal bristles scrap off stuck on food and the end scraper is perfect for the toughest jobs. Thick wood handle makes this a nice quality product. Great grill Scraper. Really ensures a clean grill and gets into all the crevices that other grill brushes miss in my opinion. I highly reccomend! This 11" wire grill or oven brush is very strong. The bristles are very sharp and scrub very nicely. The scraper on the end is sharp as well and cleans even a cool grill. This is great oven brush! Perfect for scraping any areas where food has spilled and has been burned on. It also looks amazing for the price. Powerful little brush for a fantastic price! Cleans right through the buildup on our sandwich shop/bakery ovens. Much better compared to something you would just pick up at a store. The metal scraper is a helpful addition, and the brush holds up well to repeated use and washings. This is a very solid construction brush and with some heavy use the bristles are still in place and clean well. We have used these on countless kitchen items and for the price point if one gets destroyed after some use I don't loose any sleep. Cheap and durable, we bought a few of these to keep our equipment in good shape. Stiff bristles help keep my grill and burners clean. I can't believe how well made this brush is for the price. The wire bristles are super sturdy. Has made cleaning my grill after summer barbecues way easier. A bit disappointed as after just a few uses, the bristles have really started to bend. In the worst case, we do not grill a lot and can purchase more for several uses, but we expected it to hold up a little bit longer. This eleven inch wire grill and oven cleaning brush with scraper has been great for getting the really stuck on foods. I have even scrubbed grill grates with stuck on and burnt on cheese and saw much success. I highly recommend to anyone as it is the perfect size and fits in any cleaning cart- strong bristles too!! LOVE these brushes. Perfect for cleaning a grill, I use mine frequently throughout the day and I buy them frequently. Great price and wonderful product. Great grill brush, it really works well to brush off the carbon deposits on the grill, So cheap too. I Dont know if you can find at this price elsewhere. It's small and the price is affordable. A great scrapping tool for your grill, can be used many times and left outside next to your grill for quick access. This will not break your budget and will serve its purpose! Feels pretty solid. Works well enough although the top end of the bristles did bend out of place though maybe it was my own fault for using it too rough. The scraper works wonders. I honestly don't see this brush lasting a long time but for the price you can't really complain. Maybe with light-duty use it will last a good while. You can easily replace it as this price-point. Overall I'm pretty satisfied. These brushes are nice. They really get between the grates and leave a clean slate with a couple of strokes at best. Good to have a couple around the house as well. This brush is small than expected but with very strong bristles. The scraper was also small but useful especially on small corners. Would buy again. These are perfect for grill cleaning. Since they are pretty inexpensive, we don't worry about keeping them in perfect condition. We use them for scraping our grill, and replace them every 3-4 months. Really...for the price on this thing order a couple of them. I was not sure how they would hold up buto the preformed a lot better than I expected. No one like to be the ones using them but when you have to they do the job well. I hate this product because when I use it I have to complete he painful task of grill cleaning. That being said, this tool makes it a bit less painful. It gets the job done more efficiently than any other tool i've used. Wow, I wish I had gotten about ten of these stiff wire grills for the price. I love that they have a scraper on the back and the size and length is perfect for cleaning and griping. This wire grill brush is handy. It's easy to use and easy to wash. The bristles stay stiff after multiple uses and the scraper on the end is a great addition. Right out of the box I was a little concerned because a lot of the teeth had already been bent, but has held up pretty well for the last 2 months for cleaning. Excellent, low-budget brush that keeps the grill clean. We continuously run through expensive brushes as we grill a ton (also with summer approaching). Now that we know WS offers a variety of quality wire brushes we will be back for sure. The scraper on the end is a nice addition and will help save on the brush. This 11" wire brush with a scraper is perfect for a multitude of jobs. You can use it on the grill grates, or scrubbing caked on cast iron. This wire brush gets the job done. It is not the heaviest duty brush I have ever used, but the quality is pretty good for the price. It should hold up for quite a while. If you don't have a knife or scissors around you can also use the 11" Wire Brush with Scraper to open up boxes that are sealed with tape. The edges are really sharp which is nice. Only perfect! The 11" Wire Brush with Scraper is the implement you want to help clean anything crusty or crudded up. We use ours on the oven pan and it works perfectly. Excellent quality compared to what we were using before. This wire brush and scraper is great. It is perfect for cleaning grills. Overall, it feels high-quality, and I would recommend this product to a friend. We use this brush to clean our panini press grille in my restaurant. Works good and I just buy one every six months because price is excellent. As you can see by the picture, our kitchen gets used, and used hard. This brush/scraper has been in use for 3 months! That's multiple cleanings per day, as the grill is the most used equipment besides the fryer. These brushes are top notch. You can wear the wires right down to the handle and they won't fall out or bend over in one direction. This is the reason that all of our smallwares and equipment comes from Webstaurant, you simply get the best product at the best price. Doesn't matter if it's the 1 or 2 dollar item, or the several thousand dollar item, I'm always confident I'm getting the best value. As hard as it is turn a profit these days, there's just no reason to pay double at some of the other suppliers!